This is another beauty from KIKO Make Up Milano. 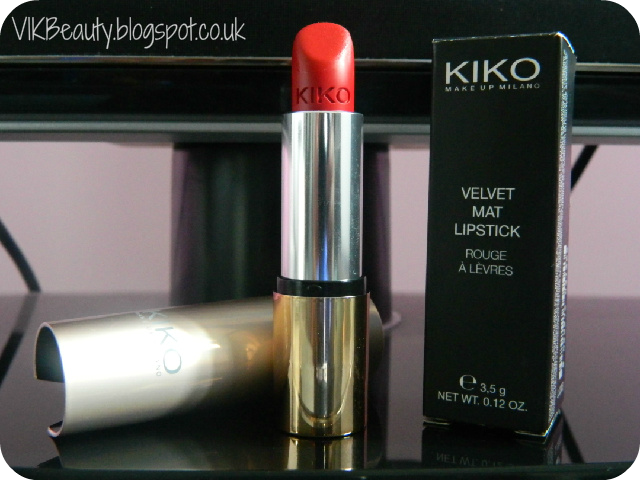 KIKO Velvet Mat Satin Lipstick in Passion Red (loving the name!) is described as: "an ultra-silky, virtually "weightless" texture that unveils unexpected moisturizing and soothing qualities in an opaque and infinitely velvety finish". This is a gorgeous lipstick. The colour is a darker, more pink based red. It exudes sophistication, elegance..ok I think I'm getting a little carried away now. 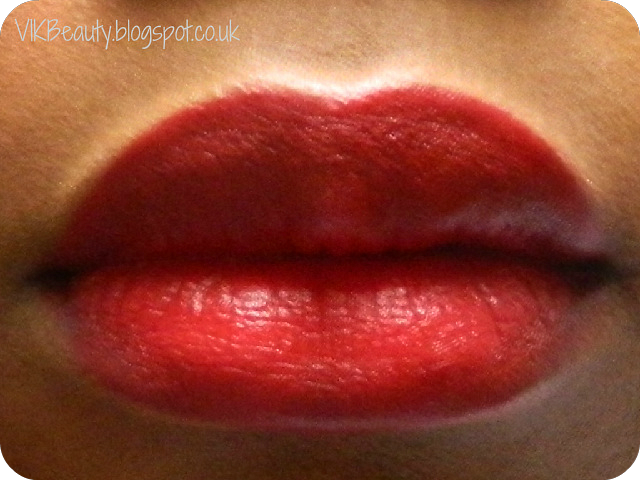 This is the sort of lipstick I would wear to a lovely evening function or a hot date. It is extremely capitivating. I have to say, KIKO are fantastic when it comes to describing their products. The velvet mat "caresses your lips with impeccable high pigmentation colour for a high coverage effect". This is 100% true. The lipstick is extremely rich and pigmented, it is a joy to apply it on your lips. Really goes on smoothly. The lipstick contains K2 Repulp which is multi-function plant extract active ingredient which has moisturising and anti aging properties. You know how your lips sometimes dry out with lipstick on (even though you moisturise them prior to applying lipstick), I didn't experience that with this product. Excuse the goosebumps, it was cold! The lipstick really lasts for hours although there can be the odd "leak". It's best to you a lipstick brush to apply it and a lipstick sealer. 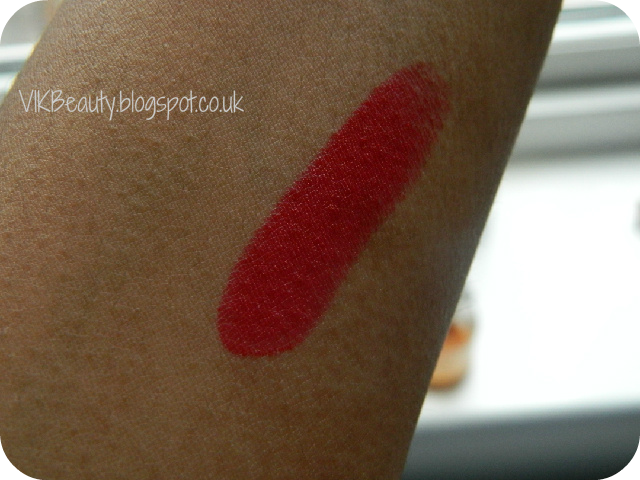 This lipstick retails at £6.90 for 3.5g which I think is great for the quality you are getting. You can pick this up at the KIKO store in Westfields in London or online. Click here. 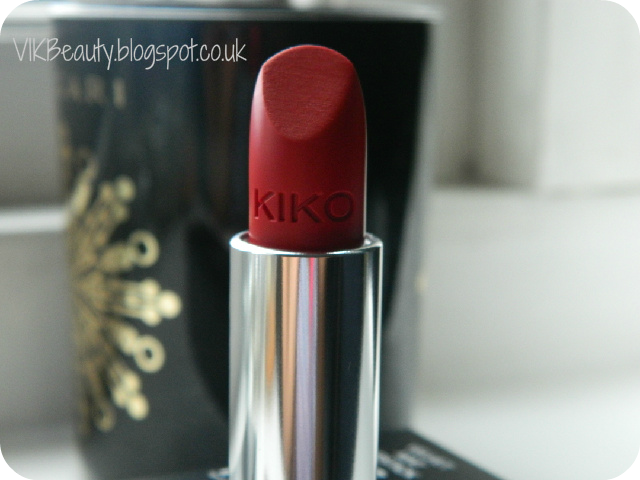 Have you tried any products from KIKO Make Up Milano? Love this on you. Red just doesn't suit me unfortunately but I think I may have to check out so,e of the other colours in the range! Amazing color! Never heard of this brand before! Well if this is both long-wearing and moisturising then it's got my vote, I have terrible trouble trying to keep lipstick on my lips and they almost always dry out. This is a really bold, gorgeous red, not much to dislike really! HOT! 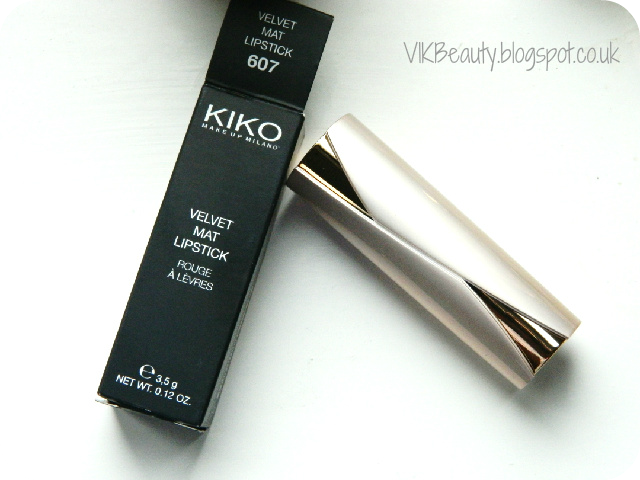 Kiko has amazing products! Gorgeous shade on u, so hawt! I love this!! Is there anyway to get this in Australia?